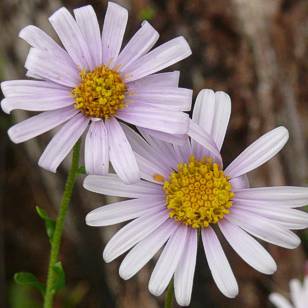 Felicia erigeroides has pretty, daisy-like flowers with yellow centres. The flowers cover the entire bush and bring colour to the garden. It is a good garden plant for coastal gardens. Felicia erigeroides is an evergreen, herbaceous perennial or sprawling shrub. It has a slender, erect growth habit 0.75-1 m high. The leaves, 40 x 8 mm, are usually 3-veined and borne in tufts. The edges of the leaves are fringed with hairs. The flower heads are borne in terminal clusters at the branch tips. The ray florets range from white, subtle shades of pink, mauve to lilac and the central disc florets are yellow. Each flower is about 10-20 mm wide when fully open and borne singly on short peduncles, 30-40 mm long, from March to July. The ray florets curl backwards and the colour deepens as the flower heads die. 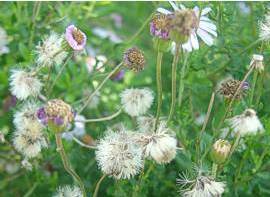 The flower heads turn into fluffy seed heads after flowering. The seeds are small, cream-coloured to light brown with hairs (pappus) attached at the tip. Felicia erigeroides is not listed on the Red Data List. Felicia erigeroides grows naturally on grassy hillsides, coastal bush and forest margins up to an altitude of 1000 m. It occurs from Humansdorp to KwaZulu-Natal. Felicia is named after Herr Felix, a German official who died in 1846. The genus consists of 85 species of which 79 species are found in southern Africa. The majority are found in the Cape Province. It is also occurs in other parts of southern and tropical Africa to Arabia. Felicia aethiopica subsp. aethiopica (wild aster), is an evergreen, forms a compact and spreading shrub, It grows to a height of 0.5-1 m. The leaves are green and 2-5 mm wide. The flowers are pale blue with yellow centres, borne singly at the tips of stems. Flowering occurs throughout the year. Felicia heterophylla (true-blue daisy), is fast growing, forms a bushy spring annual up to 0.3 m tall. Flowers are blue with a blue centre and appear in spring. It is a Cape endemic. Plant with other spring annuals such as Heliophila coronopifolia (wild flax), Dimorphotheca sinuata (African daisy) and Ursinia cakilefolia (glansoogbergmagriet). 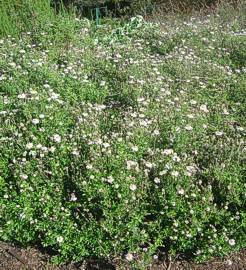 Felicia echinata (dune daisy) is an evergreen herbaceous perennial, up to 0.6 m high. Flowers are mauve to white with yellow centres and leaves are spiky, flowering from April to October and is an ideal water-wise plant for any garden. Felicia elongata (tricolour felicia) is a striking perennial with white and mauve flowers during August and September. Plant with other interesting perennials such as Chironia baccifera (Christmas berry) and Sutera cordata. Felicia filifolia (fine-leaved felicia) is a hardy perennial or small shrub, 0.6-1 m high. Leaves are fine and needle-like. Flowers are purple to mauve during October to December. Best used in rocky garden pockets, as filler plants or planted in masses to create a colourful border. The masses of pink to mauve flowers with bright yellow centres attract small insects, bees and butterflies to the garden. The seeds form fluffy heads which act as parachutes, easily carried away in the wind. 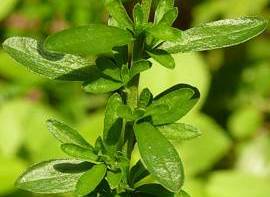 In Zulu medicinal use, a hot leaf infusion is used as a purgative for intestinal parasites and abdominal pain. Root infusions are used as a purgative for intestinal parasites in children. Felicia erigeroides is an excellent garden subject and best displayed when planted in groups of 6-9 plants. Use it as a border plant, in a mixed fynbos bed, in front of taller shrubs, in rockery garden pockets or as a filler plant. It is an ideal pot or container plant for the stoep or patio. In a mixed herbaceous border display this Felicia does well with Arctotis arctotoides (botterblom), Cineraria saxifraga (wild cineraria), Geranium incanum (bergtee), Diascia integerrima (twinspur), Lobelia valida (galjoenblom), Orphium frutescens (sea-rose), Scabiosa incisa, Ursinia abrotanifolia and U. sericea (lace-leaf ursinia), and with taller shrubs such as Acmadenia mundiana, Phylica ericoides, Hemizygia canescens and restios. Felicia erigeroides, once established in your garden, forms a round bush. It is a good coastal plant, tolerates sand and wind. It grows well in any soil, plant it in the garden in full sun, water well after planting and add a layer of compost for good results. It is quick growing, frost tender and requires light pruning after flowering. This encourages vigour, flowering, removes old flower heads and maintains the shape of the plant. Replace the plant after 2 to 3 years. Felicia erigeroides is easily propagated from cuttings or seed. New plants are easily produced from cuttings taken from new growth during autumn or spring. Take cuttings 40-60 mm long below a node and remove the lower leaves. Dip the end of the cutting in rooting hormone powder and place it in a rooting medium of 1:1 fine-milled pine bark and polystyrene. Place the cuttings in a mist unit with overhead misters and a bottom heat of 25º C. Cuttings root easily within 2-3 weeks, pot them up and allow them to grow before planting out. Once established in the garden they grow fast. Sow seed in March or April; germination occurs within two weeks; prick out seedlings and plant in bags or containers. Allow the plants to grow before planting out in the garden. Gibson, J.M. 1975. Wild flowers of Natal. Natal Publishing Trust Fund, Durban. Hutchings, A., Scott, A.H., Lewis, G. & Cunningham, A. 1996. Zulu medicinal plants: an inventory. University of Natal Press, Pietermaritzburg.